This hotel operator management agreement is appropriate for an arrangement where a management affiliate of the hotel owner will manage one or more hotel properties. The affiliate is designated as an independent contractor, and has general management authorities for the properties. All costs and expenses incurred by the operator are to be paid by the owner, and the operator will receive a specified management fee subject to a cap of a percentage of annual gross revenues. Features Manager is an affiliate of the hotel owner. The affiliate operator is designated as an independent contractor, and has general management authorities for the properties. All costs and expenses incurred by the operator are to be paid by the owner. The operator receives a specified management fee subject to a maximum percentage of annual gross revenues. 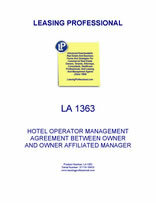 THIS HOTEL MANAGEMENT AGREEMENT (the "Agreement" or "Hotel Management Agreement") made and entered into as of this ___th day of _______, 20___, by and between Hotel Owner, LLC, a _____________ limited liability company (hereinafter referred to as "Owner"), and Affiliated Hotel Manager, Inc., a ___________ corporation, acting on its own behalf, (hereinafter referred to as "Manager"). WHEREAS, the Owner desires to engage the Manager to manage the Hotels and the Manager desires to accept said engagement, all in accordance with the terms and conditions of this agreement as hereinafter set forth. The Owner hereby engages the Manager, and the Manager hereby accepts such engagement, as the manager for the Hotels upon the terms and conditions hereinafter set forth, for a period ending on the first to occur of: (1) the dissolution of the Owner, or (2) termination of this Agreement. The Manager shall manage the Hotels, devoting such time thereto as in its sole discretion, it shall determine to be necessary to manage the Hotels in an efficient and effective manner. In the performance of its duties under this Agreement, the Manager shall occupy the position of an independent contractor with respect to the Owner. Except as expressly otherwise provided for herein, nothing contained herein shall be construed as making the Manager an employee of the Owner. Subject only to the restrictions and limitations provided for herein and the right of the Owner to terminate this Agreement as provided herein, the Manager shall have the sole and exclusive authority to fully and completely supervise the Hotels and supervise and direct the business and affairs associated or related to the operation thereof, and to that end to cause or direct the Owner to execute such documents or instruments and hire or discharge such employees as, in the sole judgment of the Manager, may deem necessary or advisable. The Manager shall direct and establish policies and procedures for the Owner's employees who will have direct responsibility for the Hotel's operations. The Manager shall have the sole discretion, which discretion shall be exercised in good faith, to establish the terms and conditions of patrol occupancy, including, although not necessarily limited to, room rental schedules, occupancy policies, and departure times. The Manager is hereby authorized to direct and control the promotional activity of the Owner's employees and cause the Owner to advertise in such media and to the extent that it deems necessary and appropriate. The Manager shall devise, establish and supervise the operation of an accounting system for the Hotel staff who will be primarily responsible for, among other things, performing all bookkeeping and administrative duties in connection with the Hotels, including all collections and all disbursements to be paid out of funds generated by such operations or otherwise supplied by the Owner. At Manager's sole discretion any or all accounting, bookkeeping and administrative duties may be performed by employees of Manager. Expenses of Manager's bookkeeping department shall be paid by all hotels and businesses, including Hotels, for which Manager performs bookkeeping services, on a pro rata per number of rooms per hotel managed basis. The Manager shall cause the establishment of bank accounts in the name of the Owner and shall establish and be responsible for administrating a policy for specifying the identity of signatories to such bank accounts. The Manager shall deposit or cause to be deposited in the Owner's bank accounts all receipts and monies arising from the operations of the Hotels or otherwise received for an on behalf of the Owner. The Manager shall be responsible for the disbursement of the Owner's funds in payment of all expenses incurred in connection with the operations of the Hotels. Notwithstanding the above, the parties agree that Manager may hold and invest Owner's monies in accounts held in Manager's name, pursuant to the terms and conditions on Exhibit B attached hereto and incorporated herein by this reference. Manager shall negotiate and enter into leases, licenses, permits, service contracts, employee agreements, and agreements for guest room rental on behalf of Owner, in Owner's name. Notwithstanding anything to the contrary set forth in this section, the Manager shall not be required to do, or cause to be done, anything for the account of the Owner (1) which would make the Manger liable to third parties except in the course of managing and operating the Hotels; (2) which may not be commenced, undertaken, or completed because of insufficient funds available in the accounts established pursuant to this section; (3) which may, under applicable law, constitute an impermissible delegation of the duties and responsibilities of the Owner, including but not limited to, the purchase or construction of capital improvements, the sale or disposition of all or substantially all of the Owner's assets, and any action which may result in a change in the Owner's primary business; or (4) which may not be commenced, undertaken, or completed because of acts of God, strikes, governmental regulations or laws, acts of war, or other types of events beyond the Manager's control whether similar or dissimilar to the foregoing.